There’s a photo above my desk, from 1994, that I’ve carted around for decades now. That year was a turning point for me. Fresh off 12 months of homelessness in San Francisco (at the time, one of the only cities where you could be gainfully employed and still experiencing homelessness), I finally had a roof over my head — a 12-foot trailer with no working toilet or shower (we had to get creative) an hour outside of the city. I received my first Macintosh computer that year, a big box with a little nine-inch screen that I paid for in installments. I toiled away writing essays at night, and by day editing my new lesbian magazine Girlfriends. My days of in-the-street ACT UP and Queer Nation protests were giving way to a busy career as a queer journalist, but even as the AIDS-related deaths around me had begun to slow, my friends were still becoming poz, and the Bay Area Reporter’s famous obits pages were still filled with people I knew (many, like me, still in their 20s). After homelessness, I had also acutely begun to realize how much affordable housing was tied to good physical and mental health, safety, and security. But with the stigma around HIV, those who were poz, in many places, were still being evicted from their homes after their status was discovered. 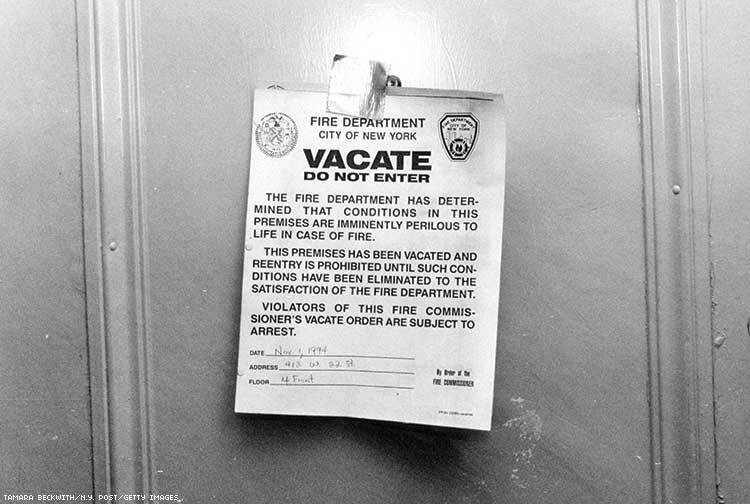 That’s what Tamara Beckwith’s 1994 photo above my desk shows: an eviction notice a tenant coming home to his New York apartment found tacked to his door due to his HIV-positive status. I heard similar stories back in the day, and from some of my friends when their boyfriends or partners died (long before the protections of marriage equality) and the partner’s unaccepting family swooped in and booted them from their own homes. That’s illegal today thanks to the Fair Housing Act, but one Google search and you’ll see that many people with HIV still worry about losing their housing, losing rent control, or being bankrupted by medical costs. In 2015, the AIDS Housing Alliance of San Francisco reported that people with HIV are disproportionately affected by homelessness, with 14 percent of people living with HIV in S.F. being homeless at any given time. I can only assume it’s even worse now. Above: In the 1990s, people could be evicted from their homes for being HIV-positive, as shown in the photo above taken circa 1994 by Tamara Beckwith. This isn’t meant to be a bummer, and I do have a point. People living with HIV are a resilient bunch. The long-term survivors from this issue’s feature have all lived through the changes between when that poz man came home to an eviction notice in 1994 and now, when hot dudes living with HIV become Instagram influencers. Some of you have been here since the early 1980s, when HIV didn’t even have a name — much less a treatment — to today when it’s a manageable condition. There’s now a pill that prevents contraction. HIV can now be suppressed and untransmittable without condoms, and, whether it does it well or not, the government is mandated to protect your right to work and live and love. There are so many issues those living with HIV for decades face, from drug resistance to survivor’s guilt. Those same men and women who lived through weekly obits filled with friends and lovers were here in the ‘90s when antiretrovirals came out. In 1998, Plus magazine was launched and BAR printed its first zero-obituaries issue. There are loads of issues to unpack, but this year we plan to make long-term survivors an urgent part of every conversation. Tell us your story now and keep reading.